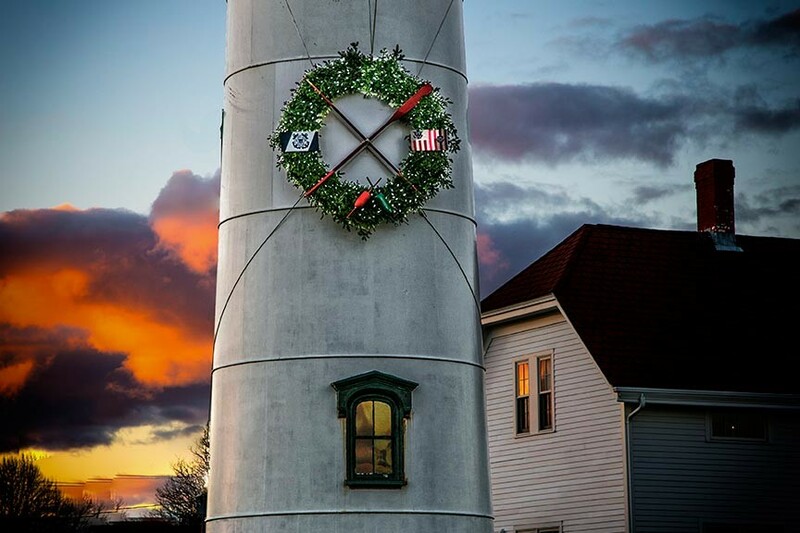 Make it a Cape Cod Christmas this year with a visit to Falmouth Village! We’ve lots going on for the holidays, including concerts, historic house tours, tree and wreath festivals and so much more. Last post, we talked about the upcoming Falmouth Holidays By The Sea Weekend (December 7th through the 9th). This annual event sees a host of fun events, like the annual Holiday Stroll, carols at Nobska Lighthouse, and a Christmas parade. But the Holidays By The Sea Weekend isn’t the only Cape Cod Christmas celebration – not by a long shot! You can ride the Train to Christmas Town on the Cape Cod Central Railroad, stroll through Edaville’s Christmas Festival of Lights, or peruse the annual Glassblower’s Christmas at the Sandwich Glass Museum. In fact, the whole region sees a wide variety of holiday-related events and festivities every year. Below are a list of upcoming Cape Cod Christmas events occurring nearby our Falmouth B&B. The annual Festival of Wreaths is the Nantucket Whaling Museum’s way of kicking off the holidays – and you’re invited! Come view and bid on a variety of wreaths crafted by local businesses, non-profits, schools, and organizations. Fascinating and fun. You say you missed Nantucket Whaling Museum’s Festival of Wreaths? Worry not – there’s still time to come see the annual Festival of Trees! The Festival of Trees transforms the Whaling Museum into a festive winter wonderland with community-crafted trees. This year the annual event marks its 25th year. What surprises will the silver anniversary hold? Visit and discover for yourself! Join the Greater Falmouth Community Chorus for Starry, Starry Night” – and evening or afternoon of great seasonal classics with new selections from Maestro John Dulina. “Choose Something Like a Star” is the inspiration for this year’s concert. Come listen or even sing along! Come celebrate the season at the Falmouth Museums on the Green. This season’s Christmas Traditions tour picks up one year later, December 1918, at the Wicks House. The week also includes a Gingerbread House for Kids, Holiday Market & Greens Sale, and more. Of course, the aforementioned Falmouth Holidays By The Sea Weekend (December 7th through the 9th) will provide a cornucopia of holiday events for your Cape Cod Christmas getaway. Our Falmouth bed and breakfast is even getting in the act with an open house on the 8th and a Cape Cod lodging special! Captain’s Manor Inn is proud to be a part of the festivities with an Open House on the 8th. Our open house will include yummy food and drink along with a 15 minute concert by the Merry Dickens Carolers at 6pm. We’re even offering a Cape Cod lodging special for those staying with us during the Falmouth Holidays By The Sea Weekend. Call (508) 388-7336 now to reserve your room before they’re all gone!